This year, Holy Trinity Episcopal Church plans to send Ernie Colquette, Anna Fokina, and possibly others on a mission trip to the Dominican Republic as part of the Clearwater Deanery Mission Team. Who is Involved in This Mission Project? 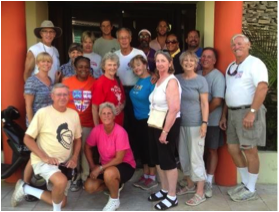 Each year, a dedicated team of Christian volunteers from the Episcopal Churches in the Clearwater Deanery minister to our sister churches in the Dominican Republic. The volunteers are of all ages and experiences and have one common goal: to help others help themselves and spread the Good News of our Lord Jesus Christ. Over the years, they have helped in church construction, provided educational facilities for children, offered Vacation Bible School to the children, and even partnered with local church members to start a small business. What is The History of This Mission? Our Clearwater Deanery teams have labored alongside our Dominican brothers and sisters on construction and offering Vacation Bible School since 2002. The construction teams worked on projects at Jesús Peregrino for three years helping to build the second floor of the church, which serves an extremely impoverished area. They now hold Christian education classes, and provide meeting space for community activities as well as provide classroom space for street children from the adjacent shelter. 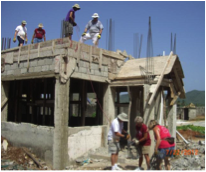 In 2005, construction began on La Redención, a two-story church and primary school to serve both the spiritual and educational needs of the people of the area. The project was completed and classes are being held on the first and second floors. In 2012, construction began at San Bernabé Mission and the team tied the reinforcing steel for the first floor roof on the new San Bernabé church. They also painted the exterior and basketball court of San Matias school in nearby Santana. In 2013, the team painted the inside and outside of the San Bernabé church building and built the pews and altar furniture for the church. 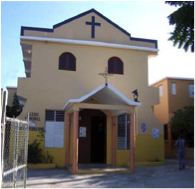 In 2014, the team completed work on the church building and pews at San Bernabé Mission and repaired and sealed the roof of the school as well as worked on the roof of San Matias school. What is the Project for 2015? The 2015 team will return to Jesús Peregrino Church and School where they began work in 2002. The project for the team is to remodel the kitchen and dining area so that the school can provide breakfast and lunch for the students. A new mandate from the D.R. government now requires all schools, both public and private, to offer 8 hour school days with a noon meal included. This new policy shows a real commitment by the government to the improvement of the education offered in the Dominican Republic. However, it creates the challenge to retro-fit all the public and private schools with kitchens and cafeterias. The hope is to complete the Jesús Peregrino kitchen and dining area in 2015. They will make major modifications to the existing kitchen, including new cabinets, counter tops, appliances, and flooring, as well as painting and making modifications and repairs to the large adjacent room which will be used as the cafeteria. 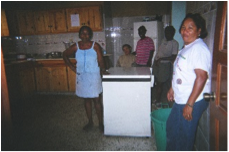 In addition to the work on the kitchen and dining area, there are many other repairs needed at the school and church. In 2016 the team will help build the kitchen and dining area at the school at nearby La Redención. What about Vacation Bible School? The team has held Vacation Bible School in multiple years, serving many of the local children in the areas where they have worked. They will not be holding a Vacation Bible School this year due to the limitations of the facility while the construction work is done. It is hoped that additional Vacation Bible Schools will be held in the future. The cost of the project must be covered through the generosity of Church members like yourself, and friends of the Episcopal Churches in the Clearwater Deanery. The estimated cost for the project is approximately $1,800 per missioner. This cost covers transportation, food, lodging, and construction material. WE REALLY NEED YOUR HELP TO REACH THIS GOAL!!! These people are in great need. Without the financial support of the church, family, and friends, none of this work would be possible. The Lord and your Dominican brothers and sisters need your help!! You can truly help to change lives! IF YOU ARE INTERESTED IN GETTING MORE INFORMATION, OR JOINING THE MISSION TEAM, PLEASE SEE OR CALL ERNIE COLQUETTE (727-785-3017). I strongly encourage you to pray for the upcoming mission trip to the Dominican Republic, and to make a financial gift to help support the missioners who are participating in this mission. Your gift is tax deductible and will be used only for the Clearwater Deanery Mission project in the Dominican Republic. Checks may be made payable to Holy Trinity Episcopal Church, marked for “Dominican Republic Mission Project” in the memo line, and forwarded to Holy Trinity at 3200 N. McMullen Booth Road, Clearwater, FL 33761. Call 727-796-5514 to pay by phone using your credit/debit card or checking account.